The 14th of May 2010 still is undoubtedly one of the top three days in my life. Where? Bwindi Impenetrable National Park, Uganda, East Africa. 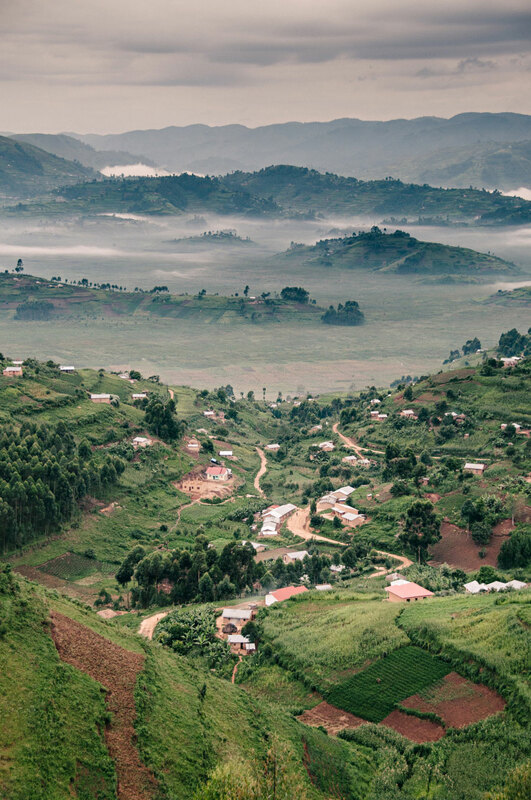 Home to half the world’s population of critically endangered Mountain Gorillas and located amidst some of the most breathtaking scenery on the continent. Given its proximity to the borders of Uganda, Rwanda, and the Democratic Republic of the Congo, the gorillas move about freely between these countries. This trip was something I’d been thinking about for over 2 years, and honestly, no amount of thinking can fully prepare you for this experience. We were up at 4:30am and had a two hour drive along the weather worn mountain roads from our base camp at Lake Bunyoni. The roads were scary. It had been raining the night before so dirt had become mud and the road felt like a slippery slide on the cliff edges. The vehicle of choice was a 15 year old 8 person mini van, the type that would be used for a small school excursion or an airport transfer. Sunrise was due at approximately 5:30am, so we were perfectly placed to witness the waking of the jungle from the road on the way in. If you’ve never experienced real natural beauty before, this would be a life changing moment. Once through the gates we were told about the ‘gorilla rules’ then made our way to the drop off point where we hit the jungle by foot. Depending on where the gorillas decide to sleep, the trek can last from 1 to 8 hours, we were on the move for only 45 minutes before finding their nest. The time with the gorillas is limited to 1 hour per family per day, and each group is limited to 8 people. We were escorted by members of the of Ugandan Wildlife Authority who were familiar with the gorilla family and able to communicate with them on a basic level. Also present were some armed soldiers from the Ugandan army carrying AK47’s to protect the gorillas from poachers, and us from the gorillas. In the past, they have been hunted for their heads, hands, and feet, which were sold to collectors. This truly is a once if a lifetime experience, if you’re ever in the area, drop in and say hi to the Bitukura family for me! ps. Gorilla fun fact: As humans are uniquely identifiable by finger prints, Gorillas can be identified by their nose prints.